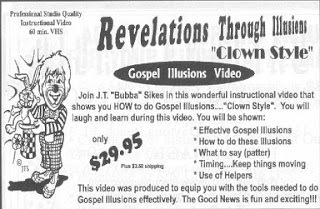 Laugh your way through the End Times, doing it "clown style," with J.T. "Bubba" Sikes's revelations through illusions! I guess there are some who would argue redundancy here, that the "Good News" is an illusion. And remember, kids, nothing says "instructional" like the word "Bubba"!